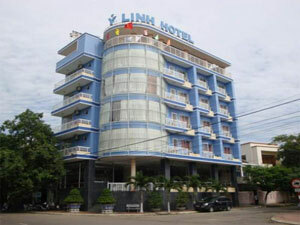 Welcome to Y Linh Hotel! The restaurant on the 5th floor is an ideal place for guests to enjoy the panorama view of romantic coastal city at night. The one on ground floor specially serves European, Asian and traditional cuisines. The wedding as well as birthday party also can be held at here. Y Linh Hotel has a large basement for parking. Coming with us, you will satisfy with the comfort and modern, considerate, friendly and attentive service by our professional staffs who serve 24/24. We are sure to bring to you a really meaningful holiday. Located on the nice beach of Quy Nhon city, Y Linh Hotel is a 3 star hotel with 7 floors. The hotel has 24 modern rooms which are fully equipped. All rooms are designed gracefully give you the convenience and cozy. The splendid decoration combination between Vietnamese culture and the modern architecture are to meet the expectations of both leisure and business travelers.